CARPROOF is Canada’s definitive source of automotive information, delivering vehicle history, appraisal, and valuation. Drawing on millions of data records from thousands of unique sources, its products enable used vehicle buyers and sellers to make informed decisions. CARPROOF is trusted to provide impartial and comprehensive information to dealerships, vehicle manufacturers, consumers, major auctions, governments, insurance providers, police and various government agencies. An estimated 1 in 5 Canadian vehicles has an unfixed safety recall, meaning they’ve been deemed unsafe to drive by their own manufacturer. 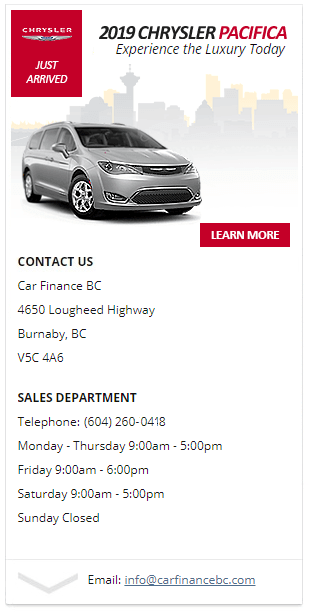 At Car Finance BC in Burnaby – we provide further ‘peace of mind’ with the safety assurance for each of our quality vehicles! At Car Finance BC, we’ve been exceeding our loyal customer’s expectations for over 54 years. Today, we remain committed to providing an unrivaled vehicle purchasing experience – that removes any pressure and provides our customers with the unparalleled level of service, superior vehicle selection and the affordability they desire.